LARGE size 20"x 24" inches Lucky Winner will Commission Original Oil painting made by me - well known Russian born Canadian artist Mark Kazav This painting has been already sold long time ago and located in a private collection. 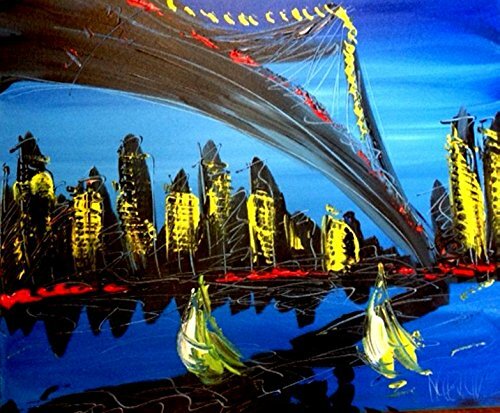 By purchasing this listing you commission a very similar painting from me based on this piece made by me previously - A professional internationally accredited artist. Most of my art is made by Palette-Knife. The painting will have the same size, colors, same characteristics, composition and the same gallery value. Similar painting does not mean an identical copy. There are no two paintings a like made by me and will never be. Each brush stroke is final and can never be repeated the same way. Each stroke of the brush has its own unique texture and shape just like a fingerprint. Nobody in this world will be able to make you such painting besides me anyway. My style is very unique and cannot be repeated by other artists. It can be very easily recognized. If you have any questions about this product by Mark Kazav, contact us by completing and submitting the form below. If you are looking for a specif part number, please include it with your message.